The Conch Republic Telegraph is a monthly newsletter produced by The Conch Republic Media Group and distributed electronically. It’s the talk about The Florida Keys and Key West, information about the people who live here and for people who wish that they did. Find out who’s got the best fish sandwich in town or this years symphony schedule. The Conch Republic is a great place for tourists on vacation and for families who love to travel. It has fabulous hotels, wonderful restaurants, fantastic events, great beaches ,world class fishing and the epicenter for Trop Rock music! While the protest that inspired its creation, and those that have occurred now and then since have been said by some as “tongue-in-cheek”, they were driven by frustrations over real concerns. The original protest event was created by a U.S. Border Patrol roadblock and checkpoint which heavily inconvenienced residents and was detrimental to tourism in The Florida Keys. Although the Conch Republic is not, and never was, a genuine secessionist movement, large numbers of Key West folks continue to relate to the concerns that motivated the original rally against what they view as an “unresponsive” central U.S. government taking action without considering all of the implications. At least three associated protests have taken place subsequent to the original incident. The Conch Republic celebrates Independence Day every April 23 as a week-long festival event of activities encompassing many businesses in Key West. The group – which is operated as a private business by its “Secretary General”, Peter Anderson – is a major tourism booster for The Florida Keys and Key West. Key West is the capitol of The Conch Republic. The term “Conch” has been applied to the descendants of Bahamian immigrants in Florida. The Bahamians began visiting the Florida Keys in the Eighteenth Century to catch turtles, cut lumber and salvage ship wrecks. During the Nineteenth Century and the early Twentieth Century many of the full time residents in the Florida Keys outside of Key West, and many in Key West, were Bahamian descent in origin. The white Bahamians in the keys continued to be known as “conchs” while other residents of the Florida Keys, mostly in Key West, began applying the term “Conch” to themselves, and it is now generally applied to all residents who live in Key West and The Florida Keys. To distinguish between natives and non-natives, the terms “Salt Water Conch” (native) and “Fresh Water Conch” (non-native) have been used. The saying “The nice thing about The Florida Keys and Key West is that they are so close to The United States” helps describe why many there think of it as a “republic”. So “conch” and “republic” equals what else? The Conch Republic. It’s a state of mind.. A place where the living is easy, the weather is fabulous and everyone is friendly. Where drinking is a sport, the women are lovely and the men….well they just like it that way. In other words, it’s paradise. 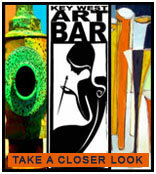 The Conch Republic has something for everyone. You and the other Conch Republic Telegraph members help make it that way. Our mission is to promote quality tourism for The Florida Keys and Keys West and to also provide an open forum where the free exchange of information can take place. 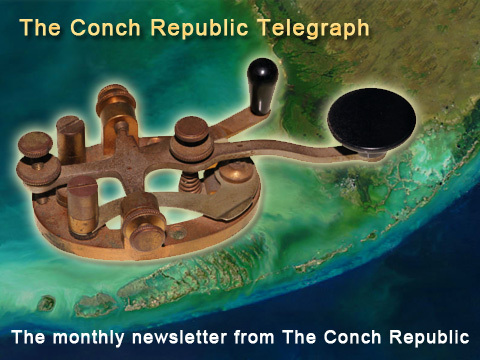 The Conch Republic Telegraph. It’s yours, it’s free, and it’s fun.